Sending and transferring large files is never an easy job and the process becomes impossible when your internet connection is slow and keeps getting disconnected. It makes you mad especially when the intended recipient keeps calling you to request for the file urgently. To transfer large files, there are various ways to do it. If your email account imposes restriction on the maximum upload and transfer size, of course you can use web based files hosting services to do so. Alternately, another old but efficient method to do it is by splitting the large files into a set of smaller files. This method was used in the golden old days when you copied big files into 5-1/4 or 3-1/2 inch floppy disks. You split the files into small pieces, send them over one by one and the recipient will need to merge them back. To split larger files into smaller pieces, there are various applications to do so. Users can use, for instance, GSplit, File Splitter, HJSplit, JonesSoft File Splitter, RapidSplit and so on. A small similar application called Akhir Split Zip came to my attention recently. 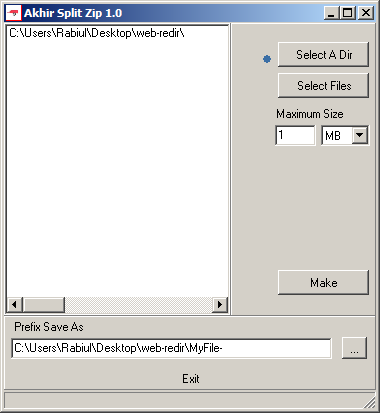 It is a freeware which allows users to split a large file into smaller pieces of zip file with a specific size. Each zip file can be extracted. It is useful for users who want to upload the files on a remote server. This tiny application is small in size and easy to use. However, it only works for the server which has enabled php-zip support.